other talents too, invited a group of us to her home for dinner. wide front porches were the residents sit in the evening. like they are very old but they are not. Isn't this a novel idea to hang the wreaths low on the door? those type items as gifts. The kitchen has a very unique counter in it. but wide and low enough to act as a family dining area. They have a mix of finishes on the kitchen cabinets. See that apple pie on the elevated counter? It was so cute and yummy too! 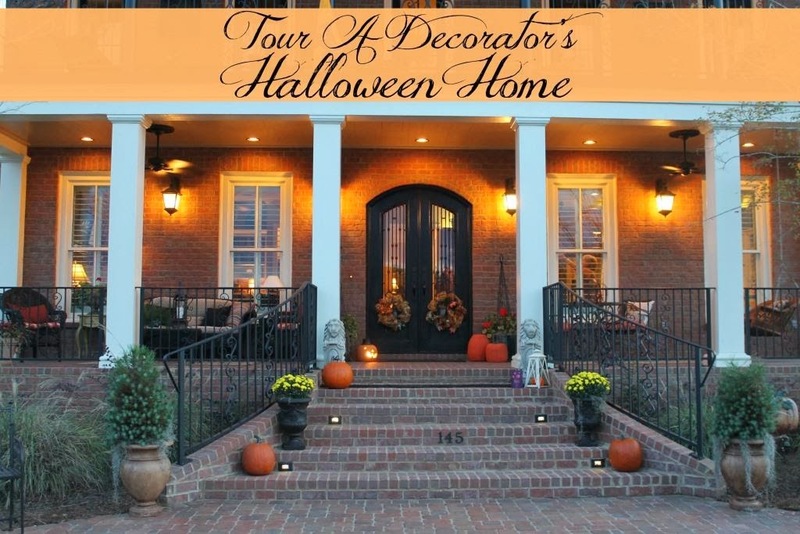 a formal dining room beautifully decorated for Halloween. chandy's) to the branches of the little tree. little water that affects that area. This is the prettiest rain barrel I have ever seen. save from paying a lot extra for the longer panels. ceiling rooms that the store "Tuesday Morning" has a good supply right now. day behind the pretty drapes. mirror and put extra lighting in this spot also. mirror's reflection on the other side of the bathroom. The Venetian-type mirror is from Hobby Lobby. against the wall and put a single mattress up against it. and a bed if an elderly guest needs to sleep downstairs. Upstairs are more bedrooms and living areas. One of those rooms has been made into a den for her husband. paneling on the walls, and beadboard ceiling. An old store's display cabinet holds family mementos. that can be seen in the photos of the front of the house. and have the burlap behind it? The last name is blocked for privacy reasons. They don't have any grass to cut! An adorable nursery for Teri's grand daughter is upstairs also. furnished the whole room for about $400. curtain tieback for the center of the princess draping. The pick-ups and bows were just tacked to the wall. Such a great idea for a bedroom for a girl of any age. door knobs that she found on sale at Hobby Lobby. maybe another post about it another time. wait and see about that. tour of this wonderful home...I hope you enjoyed it too. What a beautiful home! Thanks so much for sharing! What a gorgeous home tour! Everything feels so warm and inviting. I love all of the attention to detail! Thanks for sharing! Thanks for your sweet visit and comments, and for this amazing tour! Wow, what a gorgeous home, beautifully appointed. I love it! What a great tour! Thanks for taking us along!